The global clear brine fluids market is highly consolidated in nature. Large organizations such as Albemarle Corporation, Israel Chemicals Ltd., Great Lake Solutions, and Tetra Technologies Inc. enjoy strong hold over supply and distribution of clear brine fluids. This along with the high initial capital requirement is creating high entry barriers for new players, finds Transparency Market Research (TMR) in a new study. “The leading players are acquiring small- and medium-scale companies to strengthen their position across different geographies and also expand their market shares,” says the author of the report. 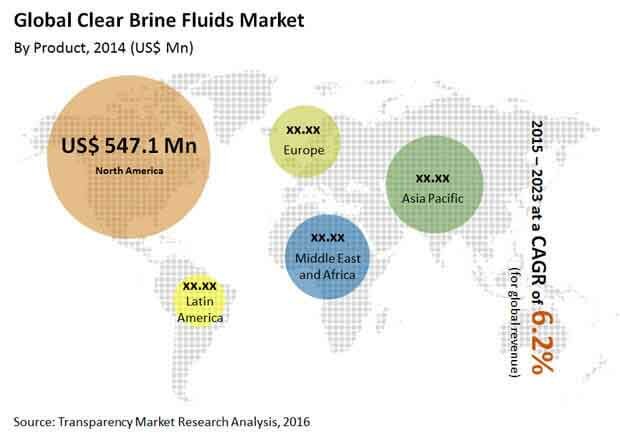 The global clear brine fluids market had a valuation of US$944.8 mn in 2016 and is estimated to reach US$1,444.7 mn by the end of 2023, exhibiting a CAGR of 6.2% from 2015 to 2023. On the basis of product, potassium chloride will continue to dominate the global market until 2023, representing 24.5% of the overall market volume. The growth of the segment can be attributed to the rising onshore drilling activities. The demand for this product type will remain high due to its less corrosive and cost effective nature. The segment is expected to expand at a healthy clip during the forecast period. Geographically, North America will continue to be the frontrunner in the global arena until 2023. The flourishing growth of the shale gas sector in the U.S. and Canada is the primary reason behind the dominance of the region. Asia Pacific, on the other hand, is poised to rise at a cracking pace of 5.8% in terms of volume during the same period. China is anticipated to be at the forefront of the growth of the region. The robust growth of the oil and gas industry worldwide is providing a significant boost to the growth of the global clear brine fluids market. “Clear brine fluids are used in reservoir sections in drilling activities and completion processes as they are able to withstand high pressure and high temperature,” says a TMR analyst. Moreover, constant efforts by developed nations such as the U.K., Canada, the U.S., and Australia to ensure energy security are leading to the expansion in the shale gas reserves. This is resulting in an upswing in drilling and exploration activities, which is leading to the greater uptake of these fluids. The prices of crude oil are witnessing turbulence due to the booming shale gas industry. The Organization of Petroleum Exporting Countries (OPEC) in order to regain its prominence in the global energy landscape are trying to keep the prices of crude oil low, which is resulting in a highly oversupplied market and sudden stagnation of exploration activities. This coupled with the ongoing political imbalance in the Middle East is leading to a substantial slowdown in crude oil exploration activities, consequently hampering the growth prospects of the global clear brine fluids market. On the other hand, the growing investments in the exploration of unconventional resources are opening new avenues for players in the market.